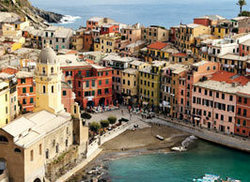 Go Ahead Tours, an international leader in discovery through guided tours and European vacation packages, has designed two new tours to feed travelersâ wanderlust and celebrate travel to popular culinary destinations within Italy, such as Florence, San Gimignano, Siena, Montalcino, Rome, Bologna, Turin and Verona. In response to the increasing popularity of theme-based itineraries, Go Ahead Tours offers travelers an entirely new way to discover the worldâthrough the flavors and tastes of Italy. These new tour packages offer a more in-depth cultural experience, since travelers will interact more with locals and sample locally produced products, like balsamic vinegar cheese and wine. Established in 1990, Go Ahead Tours (www.goaheadtours.com) offers over 75 high-quality escorted tours around the world to travelersâboth seasoned and newâwho are looking to learn more about the world and themselves. Committed to breaking down barriers of culture and geography, Go Ahead provides customers with superior quality, exceptional value and an unsurpassed Best Price Guarantee; that is, if you find the same tour for less, Go Ahead will match the price. Go Aheadâs parent company, EF Education, was founded in 1965 and is the worldâs largest private educational travel company. All prices are based on exchange rates, airfares, fuel prices/surcharges and land costs at the time of pricing (November 4, 2009) and are therefore subject to increase. Please note: Between $ 90 USD and $ 325 USD in government taxes and fees with respect to air travel, including the September 11th Security Fee, and port taxes are not part of the tour price. The MUSEA Group is pleased to announce the opening of SANGIMIGNANO1300, a uniquely different gem of a museum located in the heart of San Gimignano, Italy. More of a âhappeningâ than a museum, SANGIMIGNANO 1300 provides visitors the opportunity to truly experience and understand the historic, architectural and social aspects of this UNESCO World Heritage Site. SANGIMIGNANO 1300 features a massive ceramic reconstruction of the entire city of San Gimignano as it existed in 1300, at the height of its artistic splendour. Architects, historians and a team of artists worked nearly three years to create this spectacular and unprecedented exhibition. This exhibit, âThe City Of Beautiful Towers,â includes 800 meticulously handcrafted structures, 72 towers, street scenes and figurines, all faithfully recreated and done entirely by hand using natural pigments and terracotta. More than a ton of clay from the local quarry of Montelupo was used for this exhibit, which is already being praised and admired by the City of San Gimignano, UNESCO and the few visitors who have been lucky enough to see it. SANGIMIGNANO 1300 is the culmination of the vision of two Master Artists, Michelangelo and Raffaello Rubino. The Brothers Rubino have spent a lifetime developing their skill in their medium of choice, ceramic. Using their skill and artistry, they have created something more than a museum, they have created an artistic experience that, in all, encompasses 4,000 square feet. In addition to âThe City Of Beautiful Towers,â the museum features nine other exhibits that depict the city during its artistic prime, including the reconstruction of the Convent of San Francesco, which was completely demolished in the 16th Century, and âInside The Tower,â a reconstruction of an architecturally sectioned tower-house. Another reconstructed exhibit is âPalace life,â a three-dimensional reconstruction of a XIV Fresco by Memmo Filippuccio, done entirely in ceramic. Other exhibits on display include âOutside The Walls,â handcrafted scenes depicting medieval life outside the city walls. Visitors to SANGIMIGNANO 1300 can also witness âTimeline,â hand drawn panels that detail the history of San Gimignano from the Etruscan age to the present day, with an in-depth focus on the medieval period. A visual projection area allows visitors to view documentaries concerning the life and customs of medieval Tuscany. Visitors can also witness âA Day In The City,â featuring staged and historically accurate scenes of medieval life. Visitors can learn further information still from the exhibit âVia Francigena,â which provides a detailed graphic presentation of the Via Francigena and its spiritual and economic importance. Multimedia areas can also be found throughout the museum. These areas provide information on varying topics, including details on each developmental phase of the museum and in-depth historical and scientific aspects of medieval Tuscany. The museum boasts state-of-the-art lighting and sound such that each exhibit comes to life! Visitors will be fascinated by more than 200 handcrafted figurines, multiple street scenes, videos, symbolism and a 2,500-year graphic depiction of the city and region. Those who visit SANGIMIGNANO 1300 and want to memorialize their trip can visit the museumâs gift shop, one of the largest in San Gimignano. The shop carries a vast selection of works of art, DVDs, books and other gifts and collectibles representative of Tuscan craftsmanship. Many objects are one-of-a-kind creations created exclusively by the museum or gathered from local artisans. SANGIMIGNANO 1300 is variously a museum, exhibition and a unique opportunity to travel back in time. It represents, art, history, research and the magic vision of towers, squares and people of faith. Ultimately, however, it represents hard work, joy and a sincere desire to enhance this incredible medieval city.